Crime Watch: Soapbox: Kiwis love crime fiction, but what about our own? Soapbox: Kiwis love crime fiction, but what about our own? New Zealand readers love crime fiction. Just ask any bookseller, publicist or librarian. Or take a look at the weekly bestsellers lists: during the first four months of 2010, crime and thriller books topped our International Adult Fiction list almost 80 percent of the time, and dominated the Top 10 titles every week. It’s not surprising. Globally, millions of readers have been enthralled by such tales since a Baker Street-dwelling sleuth popularised the genre more than a century ago. And with crime writing having grown beyond the pure detective fiction of Christie-esque whodunnits or Chandler-esque mean streets – modern crime intertwines with everything from literary fiction to horror, comedy to social commentary – there’s pretty much something for everyone. With such diversity on offer – entertainment, enlightenment and escapism – it’s no wonder the genre remains hugely popular with Kiwi readers. Well, at least the offerings from overseas, that is. Because there’s a stark difference between how we treat crime fiction from beyond our shores and how we treat our own. (Calling local writers ‘second-class citizens’ would be a euphemism.) But why? Why have we failed to embrace locally-penned tales of mystery, murder and mayhem? Plenty of reasons are given for our lack of support for Kiwi crime writing. But do such excuses really hold water or are we just blithely accepting false perceptions? Let’s take a look. Reason one: We’re a small country, so of course we won’t have many crime writers, or we can’t put our scarce resources into supporting them. Okay, yes, we’re small compared to say England or the US. But globally there are small countries where local crime fiction thrives in great numbers, strongly supported by media, booksellers and readers. Sweden (9 million) and Scotland (5 million) spring to mind. Both countries produce several dozen crime novels each year. And by the way, it’s not like being small stops Kiwis from accepting (even expecting) that we can excel on the world stage in other arenas, from sports to science to filmmaking. Reason two: We’re too peaceful to have believable crime fiction set here – for instance there has never been a real-life serial killer in New Zealand. But even ignoring the crime-rate elephant in the room, there has been plenty of great crime writing set in peaceful countries or settings. In fact, a classic tenet is to set murder where it’s unlikely or rare, thereby upsetting the social order (such as country village tales of the Golden Age). More recently, relatively peaceful Scandinavia has become a hotbed for crime fiction. Oh, and it’s crime fiction, anyway. Reason three: We ‘don’t do genre fiction well in New Zealand’ (for example we don’t have any or many crime fiction writers and/or they’re not very good). This may be the biggest, and most troubling, misperception of all. I used to believe this myself, and I was flat out wrong. I just didn’t know about the authors we do have, historically and now. Dame Ngaio Marsh was of course one of the biggest names in the business in the mid 20th century, although even then she was celebrated here more for her work with local theatre than her detective fiction. Paul Thomas won Australia’s first crime-writing award in 1996. (We’re possibly the only English-speaking country in the world that doesn’t have an award to celebrate the best of its own crime writing.) On its release last year, the German translation of Paul Cleave’s third thriller, Cemetery Lake, jumped straight to the number two spot on Amazon Germany, just behind Dan Brown’s The Lost Symbol, and ahead of Stieg Larsson’s Millennium trilogy. And that’s just a tip of the Kiwi crime iceberg. 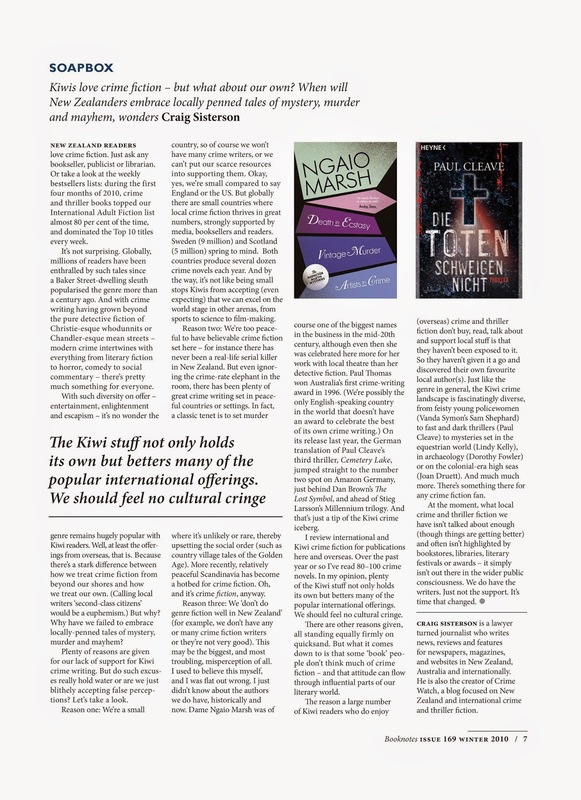 I review international and Kiwi crime fiction for publications here and overseas. Over the past year or so I’ve read 80–100 crime novels. In my opinion, plenty of the Kiwi stuff, although largely overlooked, not only holds its own, but betters, many of the popular international offerings. We should feel no cultural cringe. There are other reasons given, all standing equally firm on quicksand. But what it comes down to is that some ‘book people' don’t think much of crime fiction – and that attitude can flow through influential parts of our literary world. The reason a large number of Kiwi readers who do enjoy (overseas) crime and thriller fiction, don’t buy, read, talk about and support local stuff is that they haven’t been exposed to it. So they haven’t given it a go and discovered their own favourite local author(s). Just like the genre in general, the Kiwi crime landscape is fascinatingly diverse, from feisty young policewomen (Vanda Symon’s Sam Shephard) to fast and dark thrillers (Paul Cleave) to mysteries set in the equestrian world (Lindy Kelly), in archaeology (Dorothy Fowler) or on the colonial-era high seas (Joan Druett). And much much more. There’s something there for any crime-fiction fan. At the moment, what local crime and thriller fiction we have isn’t talked about enough (though things are getting better) and often isn’t highlighted by bookstores, libraries, literary festivals or awards – it simply isn’t out there in the wider public consciousness. We do have the writers. Just not the support. It’s time that changed. This Soapbox article was originally published in the Winter 2010 issue of Booknotes, the magazine of the New Zealand Book Council. For a long time it was available online, however that link is now broken, so I have republished it online here for the interests of future readers and as an historical record, as the Ngaio Marsh Award for Best Crime Novel sprung from these ideas and issues.